We are noticing heightened interest and increasing purchases of these versatile leads. Our presence at Crufts 2019 confirmed this with lots of questions on how to use a double ended lead. This article looks to distil key difference and the multi-uses this style of dog training lead offers. How is a double ended lead different? 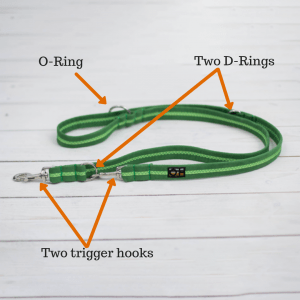 Compared to a standard lead that may be about 1 metre long and has a handle at one end and trigger or clip at the other, the double ended lead tends to be longer, with a trigger/clip at both ends. Usually there are 3 (or more) attachment points down the length of the lead. These different attachment points allow for a selection of options for your multi-purpose dog training lead. How to use a training lead with a harness? Firstly, check if your dog harness has 2 attachment points (usually one on the chest and one on the back). When attaching a double ended lead to a harness, one clip attaches to the loop on the dog’s back and the other to the loop at the dog’s chest. (The larger trigger attaches to the back clip if your lead has triggers of different sizes). In simple terms, the part of the lead attached to the back-loop acts as a brake and the part of the lead attached to the chest steers the dog. The back lead or “brake” takes the strain of any forward pulling, in exactly the same way a standard lead with handle would work on a harness or on a collar. This single lead scenario has the dog pulling in the forward direction whilst the owner is taking the strain in a backward direction. The addition of the clip attached to the chest now applies a sideways force that steers your dog off its straight-line forward path back in towards your feet. Used over time in the correct environment and with the best positive encouragement for your dog, this is a tried and tested training technique for teaching your dog to walk well on the lead. There may be occasions when you’d like to walk your dog on a longer or shorter lead during the course of your walk. Perhaps your walk starts around busy roads until you reach a nearby park or field. 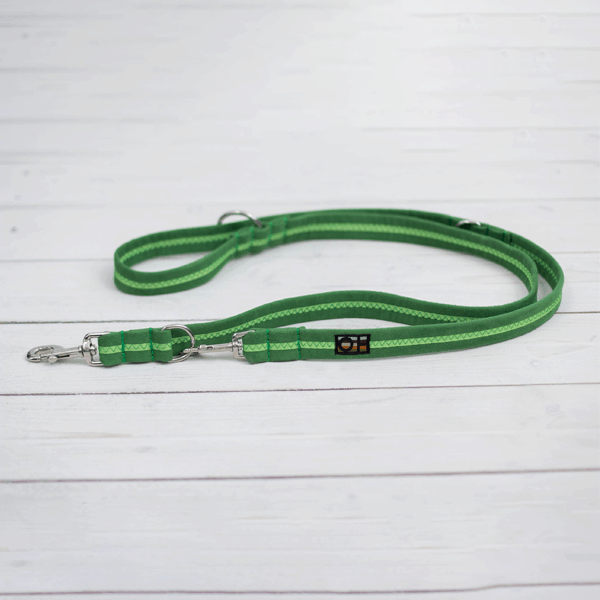 The double ended lead allows you to make a standard 1 metre lead by attaching one clip to the collar or harness and the other trigger to the clip nearest your dog. And then by moving the position of this second trigger along the other attachment points, you can make the lead progressively longer whilst still having a handle loop to hold your lead by. If you have well trained dogs who walk well on the lead then walking them both with one double ended training lead is possible. By simply attaching a trigger to each attachment point on your dogs’ collars or back loop of their harnesses, you simply then hold the middle of the lead to act as your handle and off we go for walkies! If you have a dog who walks well on the lead, you can attach one trigger to the collar or harness and then feed the other end of the lead around your body or waist and attach this end to one of the attachment points to allow you to walk along with your dog by your side for hands free walking. Have you ever found yourself at the pub/cafe on a lovely afternoon or early evening looking forward to a cold beer or coffee with a lively dog? You would have grappled with removing their lead and feeding it around your leg or the table leg. There are many occasions I can remember when we would do just this with Oscar and Hooch! The advantage here of the double ended lead is that you never have to remove the trigger from the collar or harness. You simply undo the other trigger, feed it around your chosen person or object and reattach at the most appropriate attachment point. You will see that there are many uses for the double ended dog lead as summarised here. Here at Oscar & Hooch, our double ended training leads offer the additional benefits of them being machine washable and super soft on your hands. If you think this style of lead and the many possibilities it offers are what you and your dog need then check out our selection here.